GIUSEPPE CONTE, President of the Council of Ministers of Italy, said that, in a global context which is increasingly fragmented, multipolar and in constant evolution, the international community needs more effective multilateralism and a United Nations that is strengthened in its role as a pillar of an system based on peace, justice and equity. Voicing support for the reform plan of the Secretary‑General, he also said that he wants a United Nations that is closer to the people, able to respond to their needs for security and well-being, and ready to protect them from the pitfalls of globalization, which offers many opportunities but can also produce errant effects. The Italian Government has placed these same priorities at the basis of its action, he said. Government action that does not give due consideration to assuring that all its citizens have equitable and fully dignified living conditions is not action that is morally, much less politically, acceptable. When the Italian Government is accused of populism, he said he always enjoys pointing out that article 1 of the Italian Constitution cites sovereignty and the people, and it is precisely through that provision that he interprets the concept of sovereignty and the exercise of sovereignty by the people. This approach does not modify the traditional position of Italy within the international community and consequently towards the United Nations. Security, the defence of peace and the values that preserve it, and the promotion of development and human rights are goals that are shared. Respect for the inviolable rights of man is one of the pillars on which the Italian Republic is founded. It acts as a beacon when nations are called upon to address the immense challenges of the grave and prolonged crises in the Euro‑Mediterranean area, including migratory flows. For years, Italy has been engaged in search‑and‑rescue missions in in the Mediterranean Sea and has saved from death tens of thousands of people, often single-handedly. The migratory phenomena requires a structured and multilevelled response from the international community as a whole and it is on this basis that Italy supported the Global Compact for Safe, Orderly and Regular Migration. Italy pursues the goals of international peace and security in times of budgetary constraints, he said. It is in the eighth position as a contributor to the United Nations’ regular budget and it supplements this commitment through development initiatives at the bilateral level and through the United Nations Agencies. These initiatives are inspired by the Sustainable Development Goals inscribed in the 2030 Agenda. Italy is also proud to be one of the main contributors to peacekeeping operations. This is a commitment it has maintained for many years, and for which it has received appreciation in the communities in which it is operating. Italy is a country whose core tenets contains the promotion of dialogue and inclusiveness in crisis situations. These principles are essential when addressing grave and widespread situations of instability that today characterize an area that is vital to the security and prosperity of Italy and Europe as a whole. In the upcoming weeks, his country will host a conference on Libya whose main goal is to support the shared political path and contribute to the political stabilization of the country. This path will foster the broadest‑possible involvement of the Libyan stakeholders who remain the master of their destiny. The United Nations will play a central role through the Action Plan on which all the contributions of the main and regional stakeholders will converge. Shared responsibility in the framework of building peaceful and sustainable societies is a call that is shared. 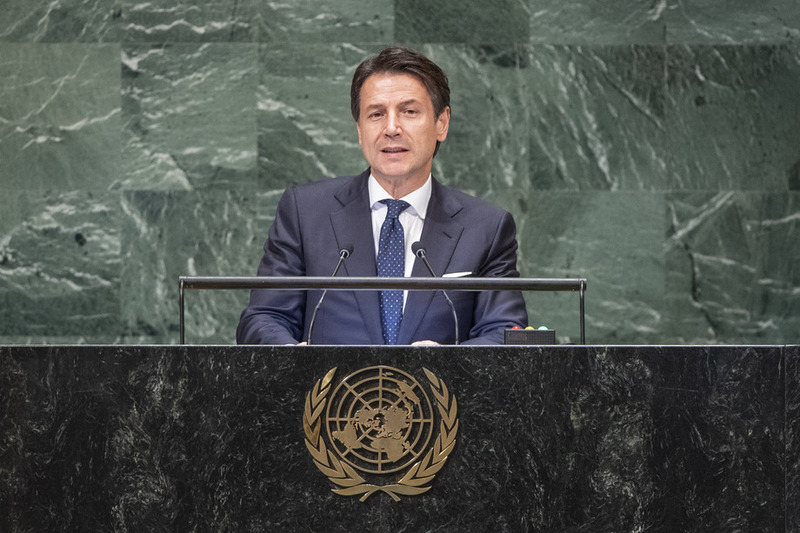 That responsibility should be assumed towards the reform of the United Nations Security Council, on which Italy will continue to pursue its deep commitment, in dialogue with all Member States, to achieve the goal of a shared reform.